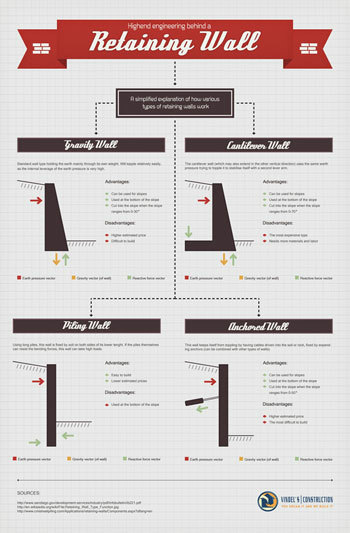 Team Renovate started the publishing of useful infographics related to retaining walls hoping that these will help those interested in the subject. The first infographic entitled Highend Engineering behind a Retaining Wall is meant to explain in the simplest way how retaining walls work. Engineering a retaining wall is not that simple, of course, it can be done by non-professionals as well but there are certain guidelines to follow if not the whole wall can collapse when it rains. Accurate calculations can be made only by structural engineers considering the fact that besides the density of the soil, which holds the wall back, and the level difference that the retaining wall will create, those who want to build a retaining wall should consider the total weight of the soil behind the retaining wall and they should also consider how the soil moves when it rains or in winter when it freezes. Each wall type is presented graphically and its advantages and disadvantages are shown as well. After the calculations are made for the chosen wall type then follows the design, which is a very important part of retaining wall engineering. If you decided that you would like professionals to build your retaining wall please don’t hesitate to call (760) 642-5414 and contact us.